This article explains how the support of Entity Framework Model-Defined Functions is implemented in Entity Developer ORM Designer and illustrates creating such methods on simple examples. The Entity model for Entity Developer used in the samples below can be downloaded here. A scalar type or a collection of scalar types. An entity type or a collection of entity types. A complex type or a collection of complex types. 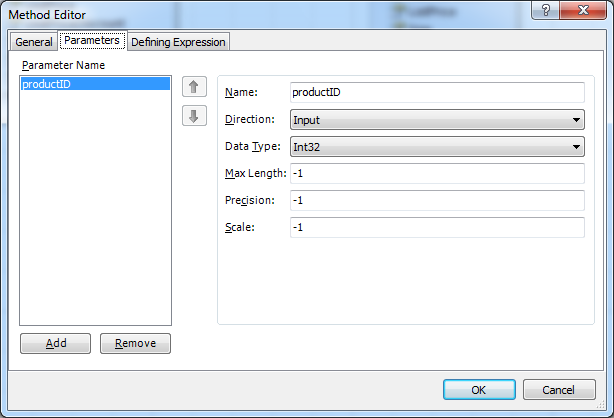 Method with a DefiningExpression do not require mapping, because the eSQL expression is composed out of eSQL fragments that are already mapped. The model we use in this tutorial needs only two entities, based on the Sales.SalesOrderDetail and Production.Product tables. You can either download the model with these two classes here or generate it from the AdventureWorks database with Entity Developer. In the Model Explorer window right-click the Methods node and select New Method… in the shortcut menu. 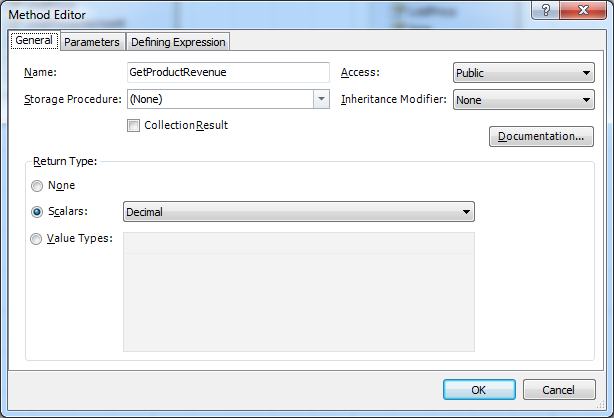 Tweak the method as shown on the following screenshot: Note: The cleared Collection Result check box means that the result of this method will be a single value of decimal type, not the collection IQueryable<decimal>. Switch to the Parameters tab. Click the Add button to add a new parameter. Note that parameter name is specified and used without any prefix like ‘@’ or ‘:’ on both Parameters tab and Defining Expression tab. 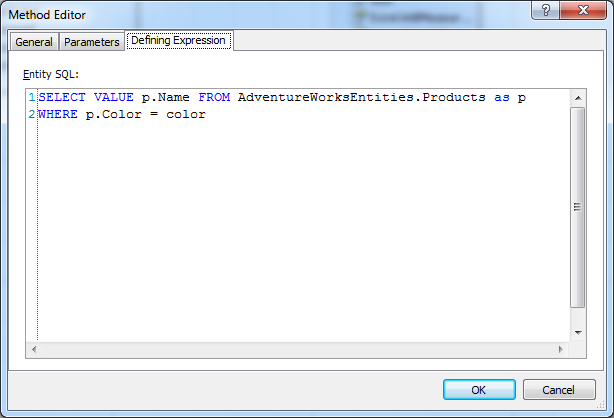 Also it is necessary to use the context name as a prefix when referencing conceptual model objects in Entity SQL text. Click OK and save the model. If you are using the standalone version of Entity Developer, start the code generation by clicking the Generate Code button on the Model toolbar. 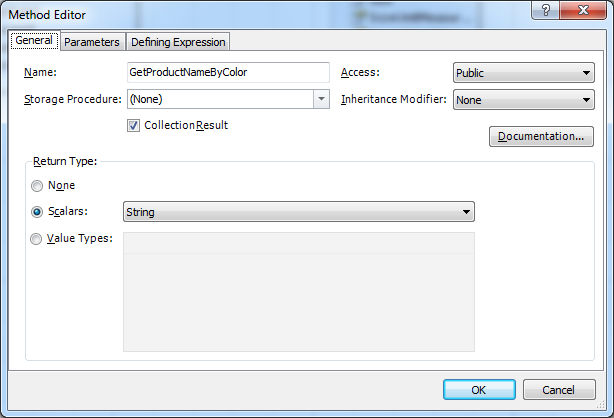 Tweak the method as shown on the following screenshot: Note: The selected Collection Result check box means that the result of this method will be a collection IQueryable<string>, not a single string value. Tweak the method as shown on the following screenshot: Note: The selected Collection Result check box means that the result of this method will be a collection IQueryable<SalesOrderDetail>, not a single SalesOrderDetail entity. 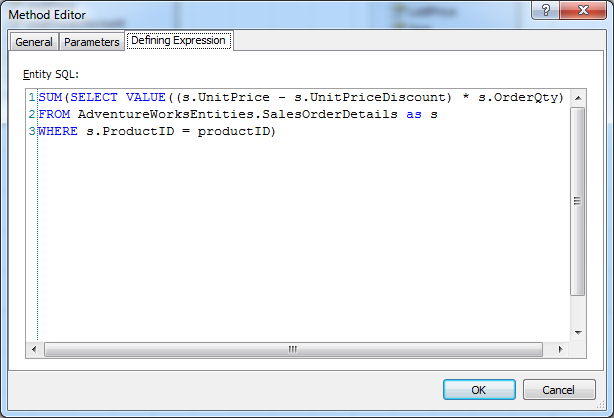 It is possible to use model-defined functions in LINQ, but this requires an extra step to create an appropriate stub method in the CLR. After this you may use this method in LINQ to Entities queries. CLR methods don’t need to be directly callable; in the example above the CLR stub throws an exception if called directly. However the existence of the stub allows you to create LINQ expressions that compile correctly, and then at runtime, when used in a LINQ to Entities query, the function call is simply translated by the Entity Framework into a query that runs in the database.